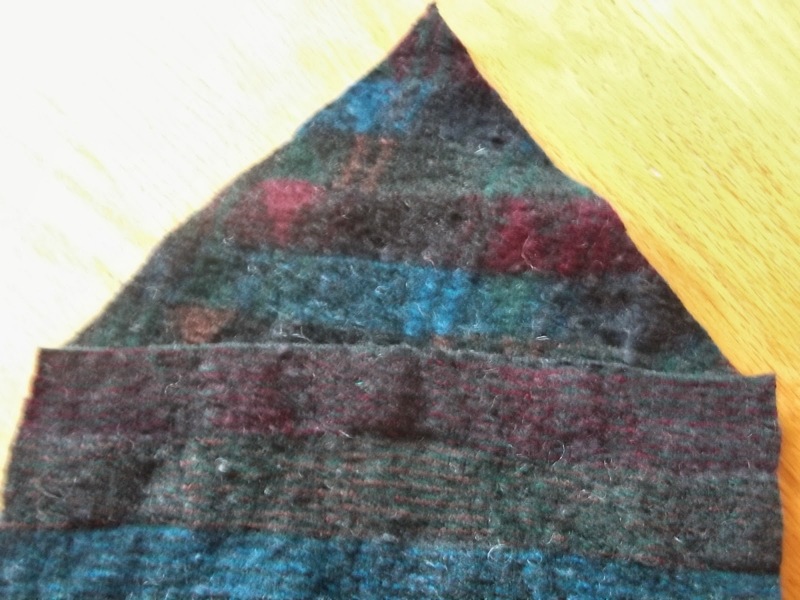 I mentioned last week that my next project was going to be creating iPad covers from recycled, wool thrift shop sweaters that I felted, and I said I'd try to share photos and show my work in progress. Well ... about half way through last week, I was seriously thinking there was no way that was going to happen. I made a whopper of a mistake. And I have to confess, it was a really dumb mistake. 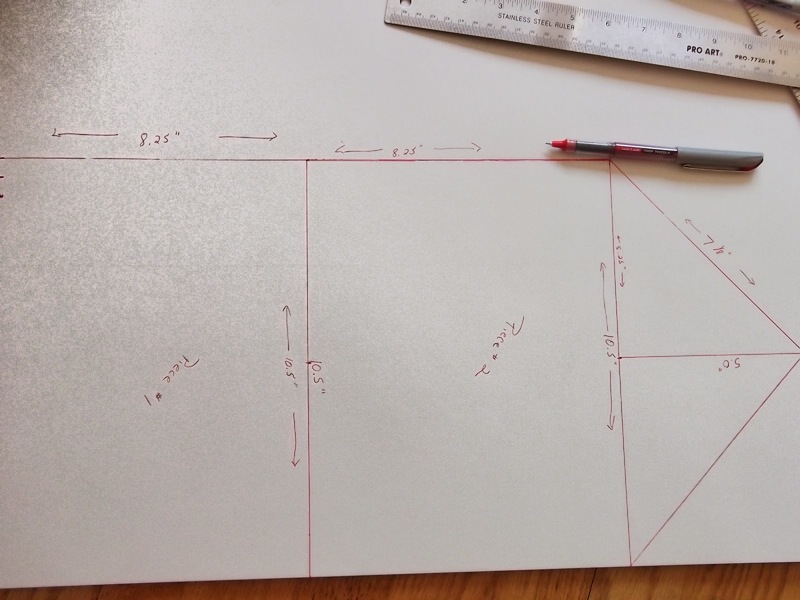 Let me show you some photos of how my project began. See if you can catch where the fatal flaw occurred! 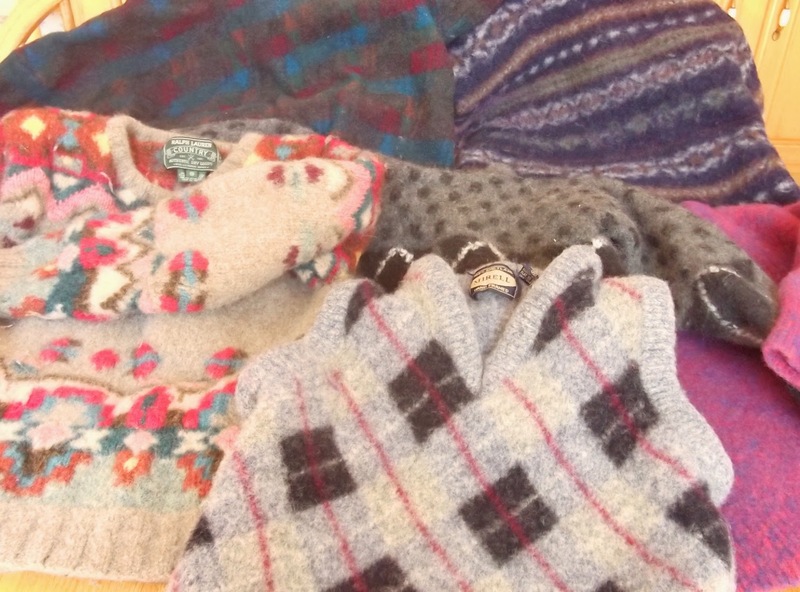 Here is my pile of felted sweaters. They are a lot smaller than they were before the super hot wash and time in the dryer. 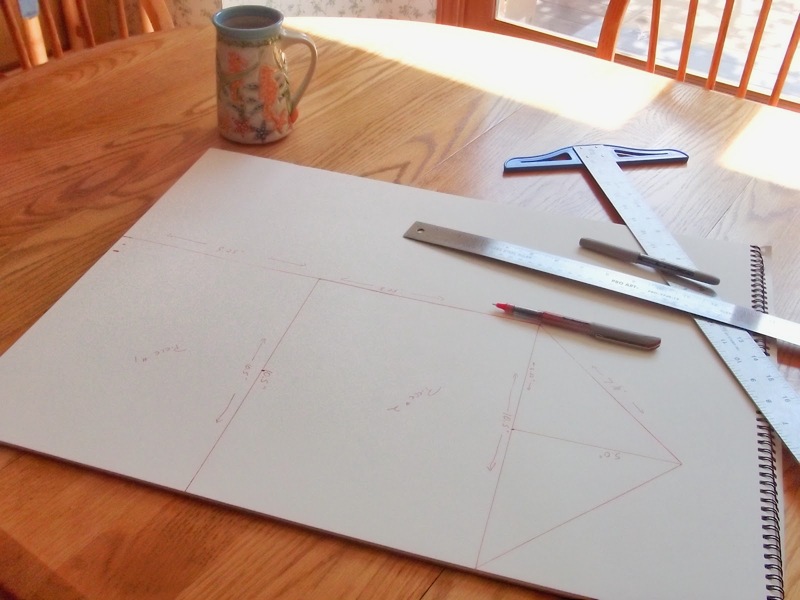 Got my cup of tea and started making my patterns. I wanted an "envelope" style bag, 1/4 inch seams, and a roughly 8 inch by 10 inch finished space that an iPad could slide into. ... and one that would hold the iPad if placed in the cover in a vertical position. Can you see the problem, yet? Perhaps it will get clearer. 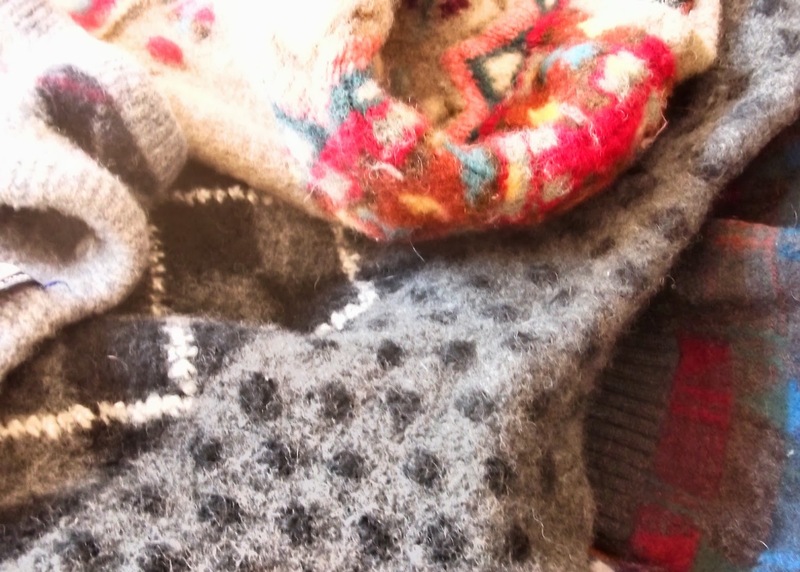 I cut off the sleeves and I will save those for another project -- maybe little purses? Glasses cases? Phone cozies? Mittens? 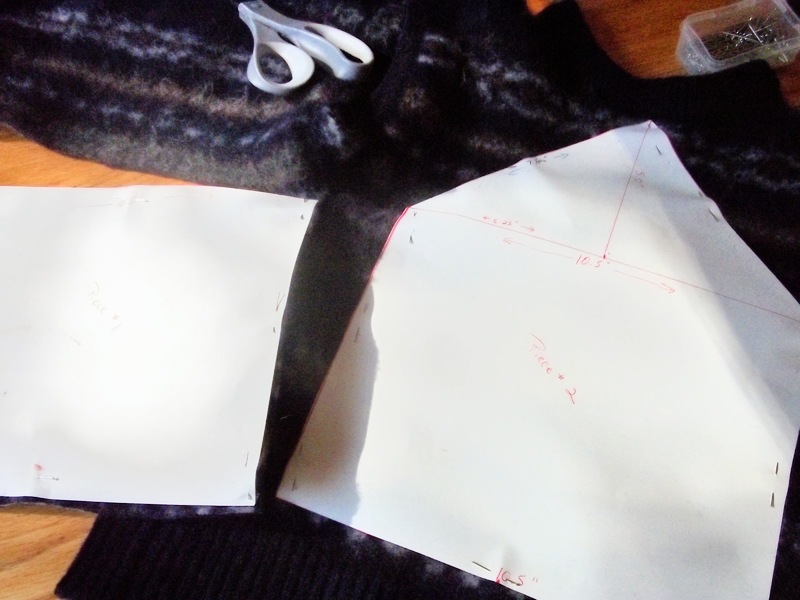 I cut open the side seam. This allowed me to lay the sweater material out flat. 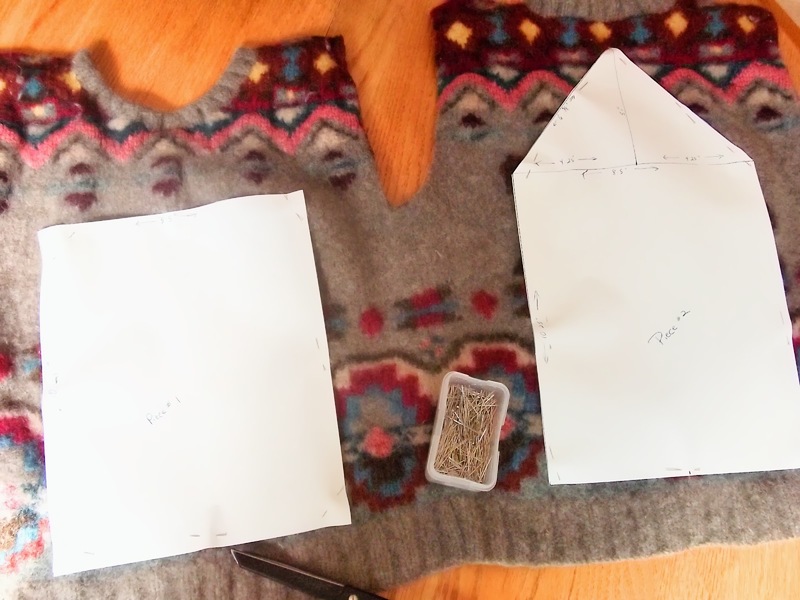 I laid out my pattern pieces, trying to be cautious about where the fabric pattern fell on each piece. I pinned the pattern pieces to the fabric. I cut the pieces out. Here, I am laying out and cutting out a horizontal version of the cover. See it, yet? If not, after you look at the next two photos, I guarantee you will get it. This is where I finally got it. 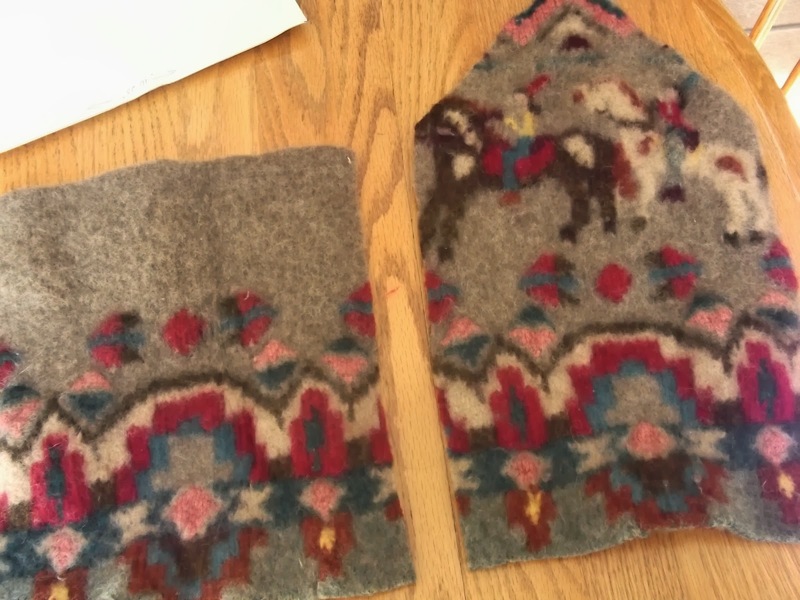 Unfortunately, it only hit me after cutting out ALL of my pieces from ALL of my felted sweaters. 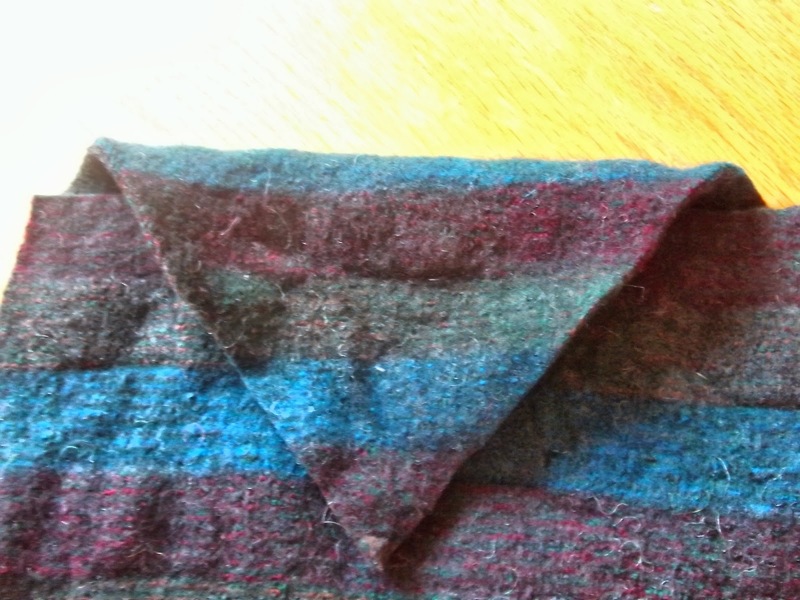 ... that I had forgotten to allow a straight section of the envelope flap, to account for folding it over the top of the bag, before creating the triangular shape! Yikes! It looked terrible and obviously was not functional. In a bit of a panic, I tried to think of how I might fix this. I considered cutting an inch off the front top of the bag, thereby creating the corresponding necessary inch of straight space on the back, fold-over piece to precede the triangular part of the flap. 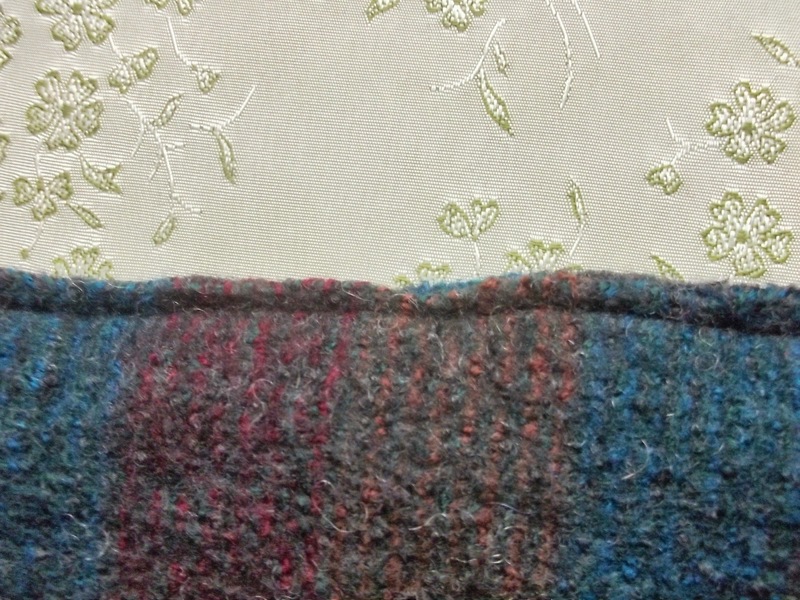 But I realized that if I did this, the pocket of the cover would be too short, or shallow, to hold the iPad. 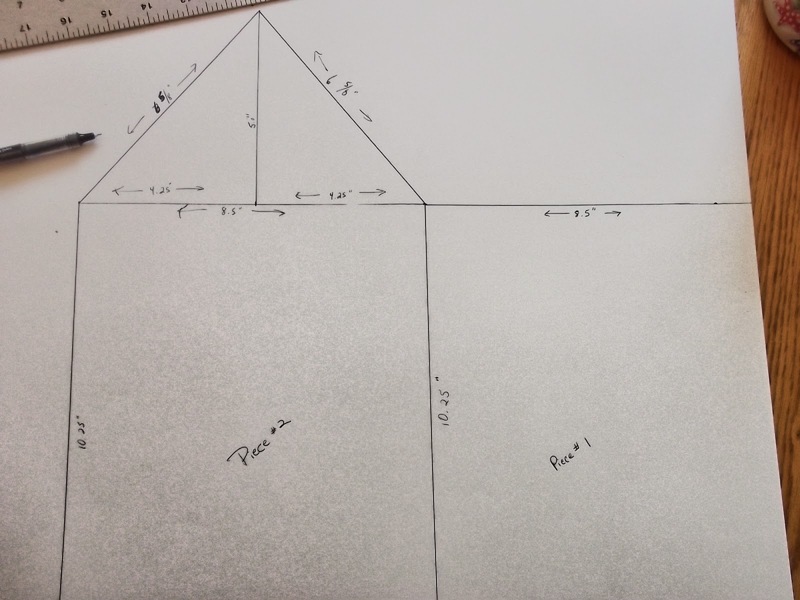 I thought about possibly finding some coordinating cotton fabric or single-color felt and splicing in a piece, an inch or two wide, between the triangle flap and the rectangle back. But I thought that would look cobbled together (which it would have been). Finally, I decided the best solution was to fundamentally alter the design of the bag. Snip! No more envelope flap. Now I had two rectangular pieces. ... around the sides and bottom, leaving the top open. 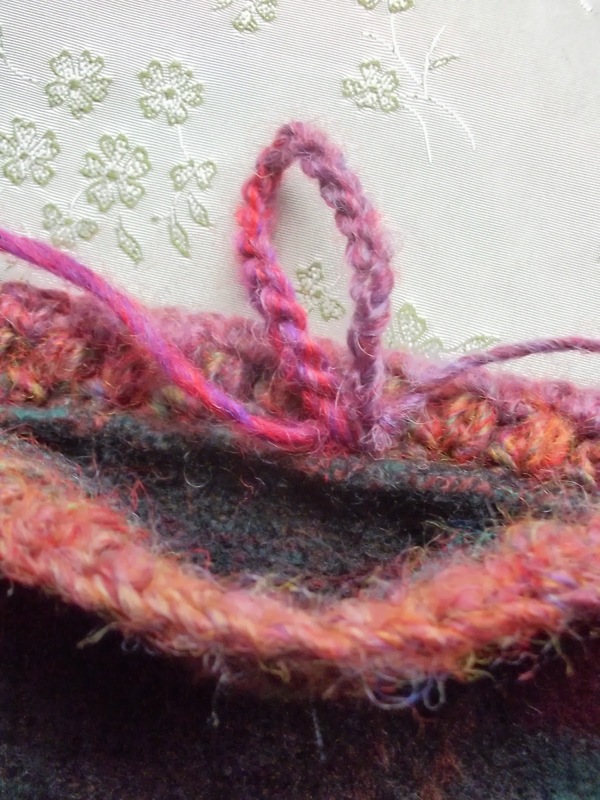 I embroidered a chain stitch around the upper, opening edge using perle cotton. 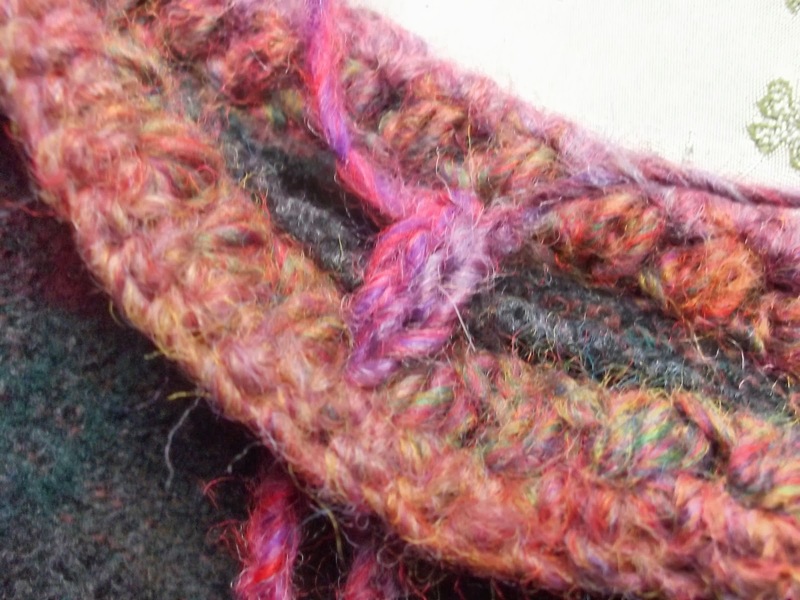 I then anchored a row of single crochet stitches in the chain, all the way around the top edge of the cover. I proceeded to add a second row of alternating cluster and chain stitches. And then finished the border with another round of single crochet. 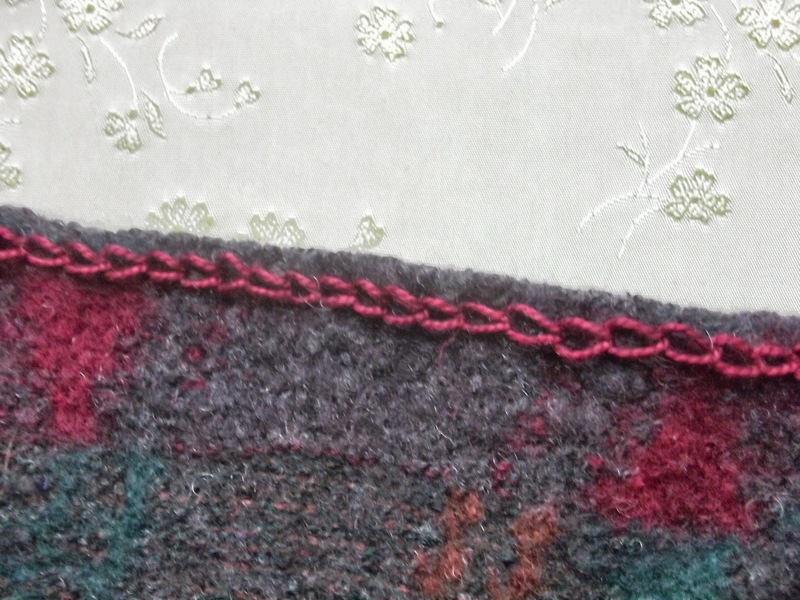 After completing the border, I crocheted a loop of chain stitches, beginning and ending at the base of the border in the middle back of the cover edge. 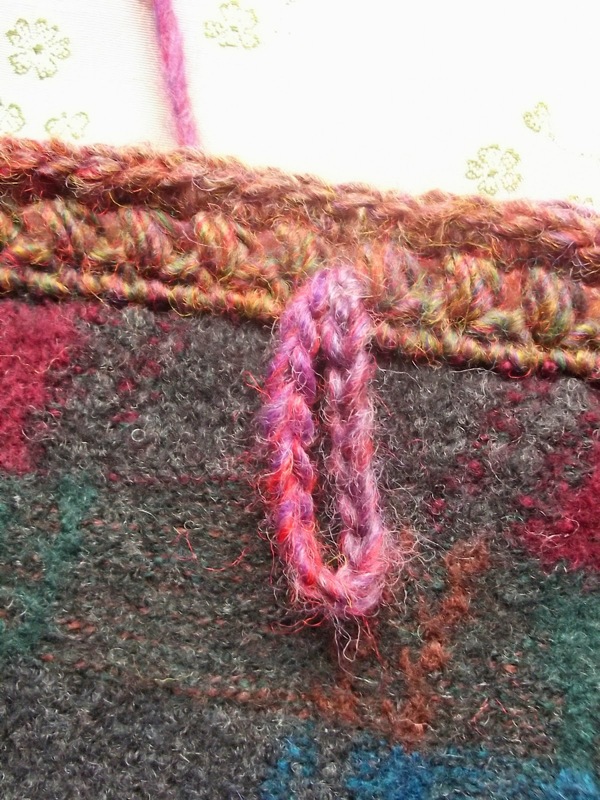 I threaded the loop through the space between cluster stitches, in the middle front of the bag border. Then I pulled the loop through to the front. To embellish my felted sweater iPad cover, I crocheted some flowers and leaves, using the same yarn that I'd used for the border and loop closure. I used cluster stitches in the flowers to mirror the stitches in the border pattern. I made one small flower and one larger flower, as well as leaves, and sewed them to the bag. I was pretty happy with how this turned out. I basically made it up as I went along. 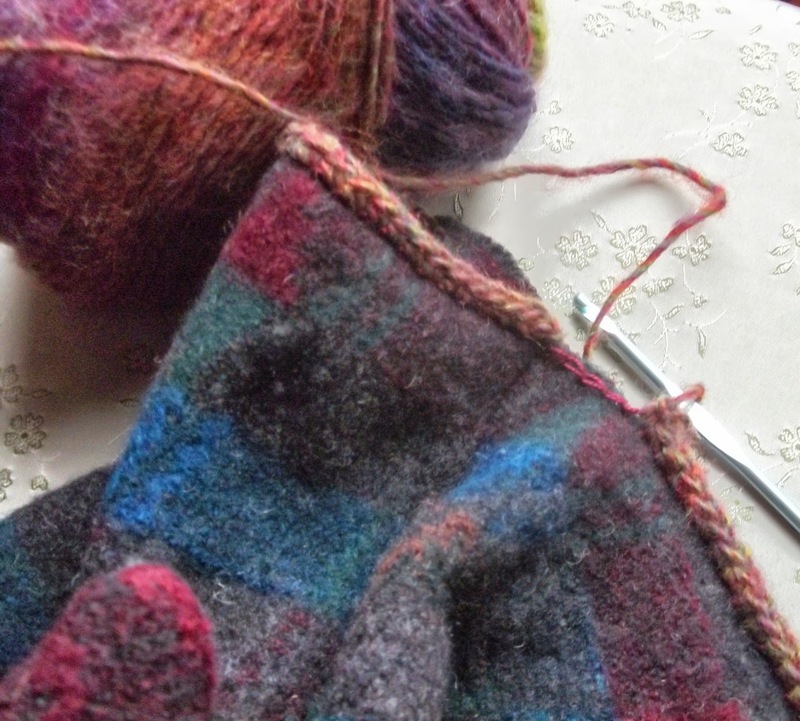 I think I am going to continue to use this basic design for the other covers -- cut off the envelope flap and have a loop and button closure, or perhaps a little crocheted strap and snap? I will experiment with different borders and embellishments, and we'll see what happens.